Zephyr is the first freestanding sculpture I've designed and produced in several years. It's always a challenge to get "off the wall" and design something that can be viewed from all angles. 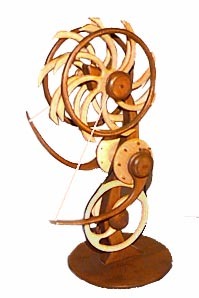 The drive mechanism and motion of this sculpture are quite simple. The arms move up and down in opposite directions. They pull on strings attached to the common axle of the upper spoked wheels. These wheels turn together several revolutions in one direction and then reverse. The basic mechanism is quite simple but the patterning created by looking through the double wheels is complex and variable. It changes with each shift in angle you view the sculpture from.